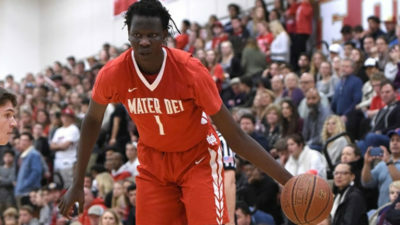 Son of former NBA player Manute Bol. Extreme length at 7-2 with a 7-8 wingspan. Blocks and alters a lot of shot in defense, keeps his arms high and keep the blocked shot on the court. Very good rebounder too. Moves surprisingly well for someone his size while displaying the ability to handle the ball and shoot pretty well. A naturally gifted player who still has a lot of room to improve. Polarizing player. Despite his tremendous talent and physical tools, doesn’t always show the requisite intensity. Often seems lazy or bored. Basketball wise, may be too enamored with his outside game and has yet to develop a NBA level post up game. Relies on low release fade aways and dunks. Very weak body and high gravity center won’t help against smaller but stronger and more athletic NBA players. Needs to gain weight while working on his lateral speed.